For me, the most satisfying parts of any role-playing game are the beginnings and the endings. There is something very exciting about embarking on an epic journey, and reaching the end of that epic journey is equally as satisfying a feeling. If there is a weakness to be found in the game, it is likely to be found in the middle of the game. It is here that the game can either follow the classic structure of rising action or lose focus and fall into an abyss of repetition. The quality of pacing in the middle parts of the game is often what differentiates great RPGs from mediocre ones. Dragon Quest IV: Chapters of the Chosen takes a unique approach to the often problematic middle hours. As the title suggests, the game is divided into a series of chapters that are self-contained beginnings and endings without the tedium that is common in long RPGs. Each chapter puts you in control of a fresh cast of unique characters with a goal that would seem to have little to do with the world as a whole. Each party makes an impact on their respective corners of the world, and you begin to get a glimpse of a greater threat. In the final chapter, the paths of the chosen are woven together in truly epic fashion against the aforementioned threat. The mechanics in Chapters of the Chosen, like those of all of the Dragon Quest games before it, are that of any straightforward Japanese RPG. Enemies appear randomly, and you can attack them with weapons or magic. As you defeat more and more enemies, your characters level up and become stronger. There are no surprises here. What is surprising, however, is the amount of care that seems to have been put into this remake. Dragon Warrior IV was originally released for the Nintendo Entertainment System in 1992, and every aspect of the game has been rebuilt to take advantage of the Nintendo DS’s hardware. The incidental music is pretty good, but the real standout is in the graphical update. The environments are rendered in 3D, which you can rotate to any angle you prefer. All of the characters, however, are represented by cute little sprites that do a good job of showing off Akira Toriyama’s classic character designs, which would have been lost if the characters had been rendered as ugly 3D models (the remakes of Final Fantasy III and Final Fantasy IV fell prey to this). Aside from a fancy new presentation, Chapters of the Chosen features an all new prologue at the beginning of the game, which introduces you to an important character from the later part of the game, as well as an additional post-game chapter, complete with an extra-tough dungeon. 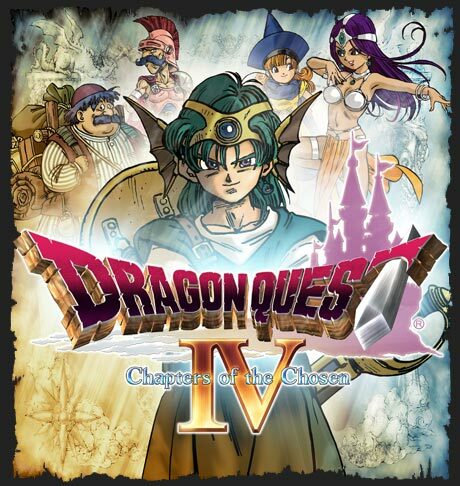 Dragon Quest IV: Chapters of the Chosen is only the second Dragon Quest game that I’ve played. The first being Dragon Quest VIII, and they’ve both been really enjoyable experiences. This game in particular is an example of how, when treated properly, a great old game can be made fresh and relevant (and portable).